Whilst eyes on traffic levels in Greenwich with the new Ikea opening today there’s gridlock further east across Thamesmead. It appears someone decided to carry out roadworkson the spine road – leading to heavy traffic across much of the town. 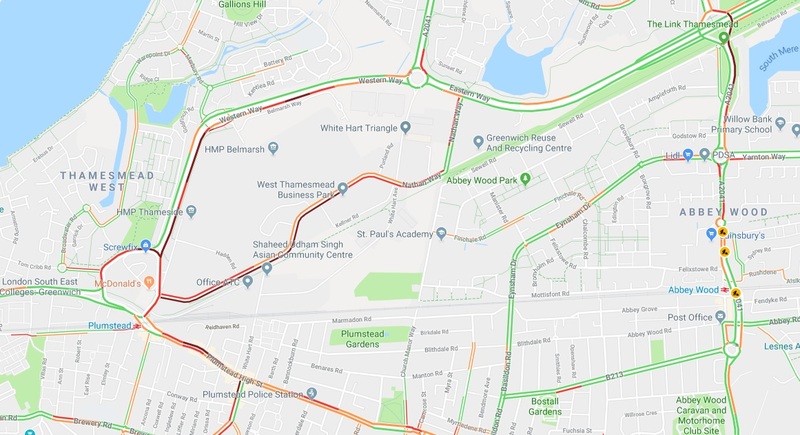 Plumstead High Street is also slow moving as is the area around Abbey Wood station. The regeneration of Thamesmead / Abbey Wood rail updates has been hugely mismanaged and trying to get anywhere is almost impossible. Bus stops are placed where traffic cannot pass instead of being inset; flats due for demolition are having unnecessary work done on them; residents are living in a continuous building site, which is proving unbearably noisy; with even more high polution than normal and making the local area dangerous for pedestrians and road users. It is an utter shambles and all have been suffering the result for years with no end on sight. This is for our own good apparently – none of the residents and local businesses would agree. Whoever is in charge of this mess needs to resign – they are highly incompetent and have no regard for the locals – just their own ego.